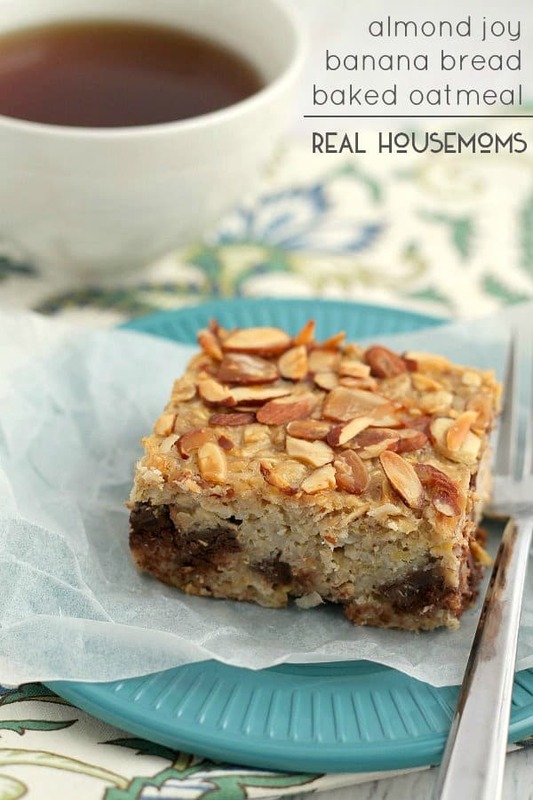 This healthy Almond Joy Banana Bread Baked Oatmeal with it’s dark chocolate chunks, toasted almonds, and coconut only tastes like an indulgent breakfast treat! Is anyone else out there a huge Almond Joy fan? I, for one, have been a fan since I was a little kid. But I am also a fan of Mounds. I know some claim that you have to be on one team or the other- nuts or not- but I don’t want to have to choose. Do you know what would make me happier than anything? If they finally decided to combine an Almond Joy and a Mounds! I would love to have my almonds and the dark chocolate coating too. But until those candy bar makers wise up and come up with a Dark Chocolate Almond Joy, I can enjoy this delicious Almond Joy Banana Bread Baked Oatmeal instead. That’s right, folks. I have just made it totally okay to have an Almond Joy for breakfast. But before you protest having a candy bar flavored baked oatmeal for breakfast, let me assure you that this is indeed healthy. 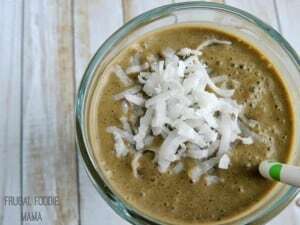 It is packed with bananas, hearty oats, and coconut milk. 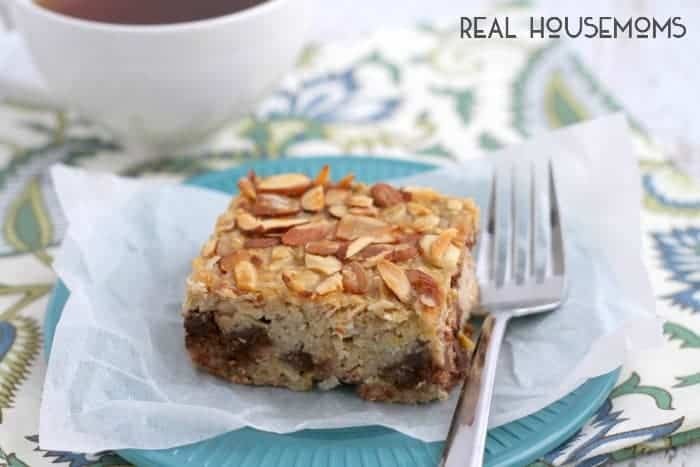 This baked oatmeal gets it’s delicious Almond Joy/Mounds flavor from the addition of shredded coconut, dark chocolate chunks, and toasted almonds. Served with a cup of your favorite coffee, you have breakfast perfection. Or dessert perfection. This baked oatmeal is totally indulgent enough to serve as a healthy dessert, and no one would be any the wiser. 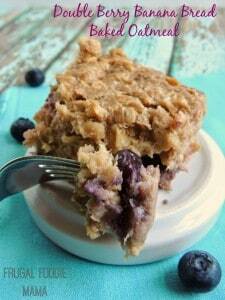 Get more great recipes like this on our Real Housemoms Breakfast pin board! This healthy Almond Joy Banana Bread Baked Oatmeal with it's dark chocolate chunks, toasted almonds, and coconut only tastes like an indulgent breakfast treat. Preheat your oven to 375 degrees. Spray an 8x8 or 9x9 baking dish with cooking spray. Set aside. In a large mixing bowl, combine the mashed bananas, brown sugar, eggs, salt, vanilla, and baking powder. Whisk until the batter is smooth. Pour in the coconut milk, and whisk well. Stir the oats into the batter. Fold in the shredded coconut and the dark chocolate chunks. Top with the toasted almond slices. Bake for 45 minutes, or until the center is set and the edges are golden brown. Let cool to warm, and then slice into 6 equal squares. Note- individual baked oatmeal squares can be stored in a resealable bag and refrigerated or frozen to enjoy throughout the week. To thaw frozen baked oatmeal squares, zap in the microwave for 30-45 seconds. Lolm, Marion! A hero?? I will take that! 😉 I hope you love this baked oatmeal as much as we did! Thank you so much, Emmy! 🙂 You could always leave the almonds off or let the kiddos pick them off. The toasted almonds are just on top of the baked oatmeal, not actually mixed in. This looks absolutely delicious! Definitely trying it this summer. Oh my gracious. That looks amazing. I will have to make this soon! Thank you so much, Sarah! 🙂 And yes- you have to add this baked oatmeal to your must-make asap list! This sounds like a perfect breakfast!! I love the flavors! 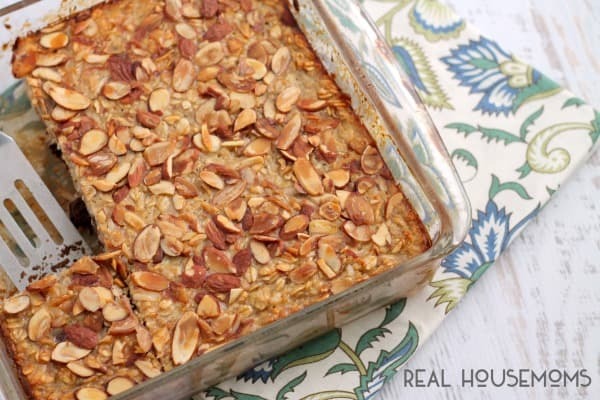 I am such a big fan of Almond Joy and love this baked oatmeal! Such a great idea and I can’t wait to make it. Looks delicious! I love the thought of this breakfast because I’m all about all things oatmeal and all things coconut, but would this be a crossover? Bananas and oatmeal are E and coconut and almonds and chocolate are S.